"Eyes Dark Circles" is Common problem of both Males and Females and give them tired and premature aged look. Skin under Eyes is the most sensitive and thinnest part of our skin without any fat and oil gland and this is the main reason why under eye muscles easily get affected by certain factors and develop ugly looking dark circles. Late night working without sufficient sleep, stress, poor diet and dehydration are some common causes for eyes dark circles. To Get Rid of these ugly Dark Circles you can Follow some given natural tips. 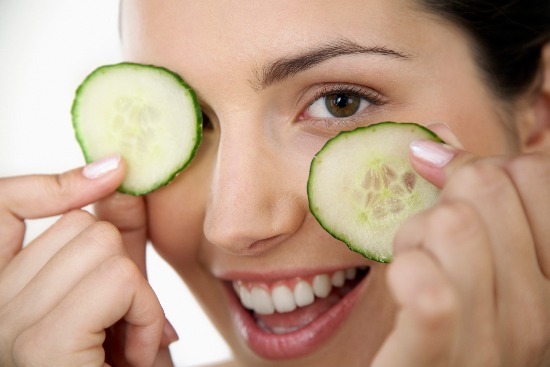 Use of "Cucumber Slices" is one of the Best Natural Home Remedy for Dark Circles Under Eyes. Cucumber not only helpful for removing dark Circles but also proved helpful for vanishing eyes redness and also diminish dryness of skin under Eyes. Before applying Cucumber Slices on your Eyes simply lay down on your back and then apply thin Slices of Cucumber on your Eyes making sure they have contact with the effected skin under your Eyes. After 10-15 Minutes remove them. But while applying them on your Eyes be careful about Cucumber water and never let it go into your Eyes. Take half cucumber and 1 normal size potato then peel them off and cut them into small slices. Add 1 tablespoon of lemon juice and half teaspoon of turmeric powder(haldi).Now mix all ingredients in a grinder or mixer to make a thick paste.Now apply this paste on your dark circles and leave this paste for 15 minutes then rinse off with fresh water.This is one of the best home remedy to cure Eyes dark circles.For quick results, before going to sleep don't forget to apply almond oil on dark circles. This is one of the best home remedy to cure eyes dark circles. A mixture of almond oil and honey should be applied on the affected area every night before bedtime. After regular application You will observe a remarkable improvement within few days. 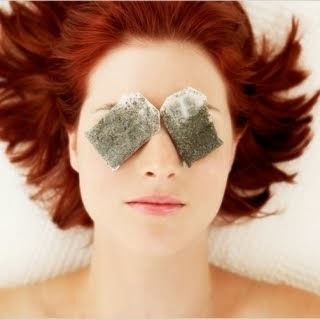 Use of black or green tea bags is also a simple and very effective way to reduce dark Circles under Eyes. Caffeine Present in Tea Bags Diminish Puffiness Under Eyes. Take 2 used Tea Bag but make sure they are Cool enough and then place them on your Eyes at least for 10-15 Minutes But be careful and don't let Tea to go into your Eyes. Soak 2 cotton pads in hot water and apply them on effected areas for 5-10 minutes. 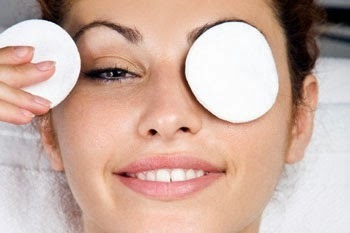 Similarly soak these pads in cold water and apply on dark circles for same time period. After removing them gently apply almond oil under on eyes dark circles.This method is also considered very effective for treatment of dark circles. 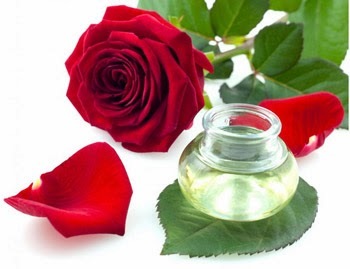 Rose water is considered a natural coolant for the body and is very effective to cure eyes dark circles. Apply two to three drops of rose water on a cotton ball and gently massage on the affected area of the eye for five to six minutes. You will see the result in two to three weeks. 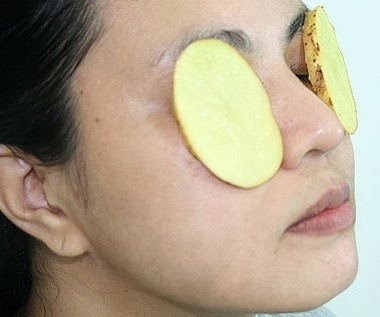 Potato juice or slices are also considered very effective for curing dark circles under eyes. Apply potato juice soaked in cotton balls on the dark circles for 15 minutes. Keep your eye closed for that period. Instead of Potato juice you can also apply 2 thin potato slices on your eyes and make sure that they have contact with the effected skin under your Eyes.After 15 minutes remove them and wash your eyes with fresh water. 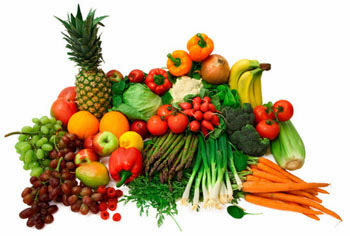 Try to include more fresh fruits and vegetables in your diet plan. Try to eat fruits rich in antioxidants because anti-oxidants fight against skin damaging free radicals and also helps in preventing eyes dark circles. Increase intake of vitamin C and eat fruits like orange, pineapple, apple, limes, guava, lemons, papayas, strawberries, black currants, grapefruit and mangoes. 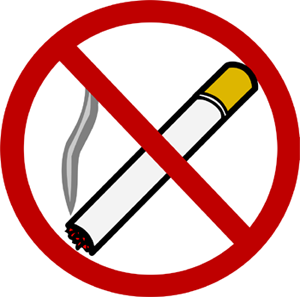 Vegetables like Collard greens, green and red peppers, broccoli, tomatoes, brussel sprouts, cabbage, potatoes, kale, spinach(palak), and watercress are also good sources of vitamin C.
Avoid Smoking because it not only weak your Eyesight but it can also constrict and damage your Blood vessels and creates lot of problems for Blood passing through them. Blood Capillaries Under Eyes are so thin and delicate that if they have been constricted due to Over Smoking then Blood has to face difficulty in Passing through them. To get rid of Eyes Dark Circles Water should be an essential part of your Diet. It is compulsory for you to Drink at least 8 to 12 Glasses of Water because Water is quite helpful in releasing of Body's wastes and keeps Eyes Fresh. Besides water you should also try to drink juices of Tomato, Carrot, and mint because all these juices are also considered very effective in reducing eyes dark circles. Lack of sleep badly affects the muscles underneath the skin and results in tired and fatigued muscles. Besides this, lack of sleep also causes weakening of the capillaries under eyes. 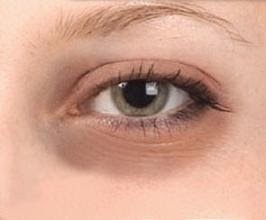 This in turn causes blood leakage whose storage under eyes appears like dark circles. Proper and Uninterrupted sleep on 6-8 is also essential to reduce and prevent eyes dark circles.